An average worker spends a third of each day in his personal workplace, so it stands to reason that the space he works in could have a significant impact on his outlook and wellbeing. A dark, dingy, cramped office where people are carrying out highly pressurised roles, for instance, will not be conducive to a good mindset. In this situation the likelihood of increases in stress and anxiety is high, and this is something companies need to be aware of. Any worker is different and works in a different way, so why should we expect to have create flat workplaces where employees thrive under the same conditions? An office with an open and flexible layout allow employees to easily collaborate but should always be juxtapose to quiet workspaces where employees can have privacy when they need will take an active approach to their job. 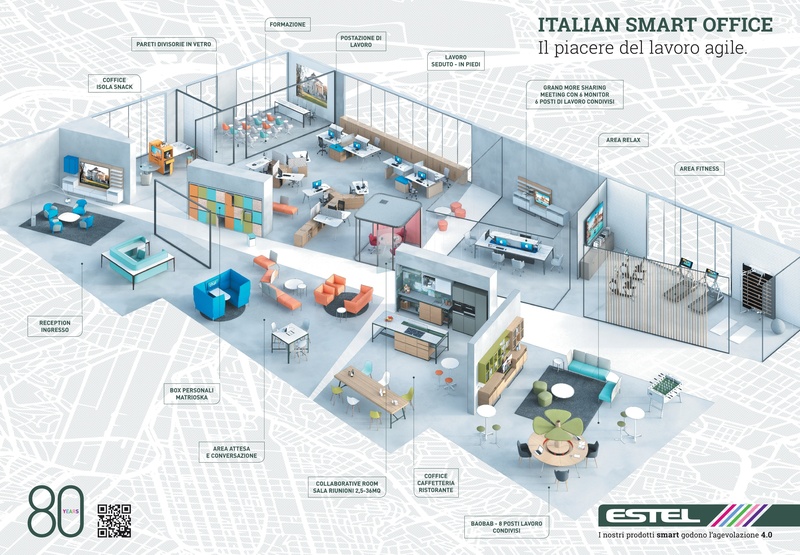 In our credo the smart office needs together two main elements: advanced facilities management systems, and the Internet of Things (IoT), to create an office experience not dissimilar to using a smartphone to manage different life moments. With these two components, merge with a fllexible layout, is possible to create a unified and functional workspace where the benefits stack up against the traditional office. Choosing employee-focused environments, not only fosters healthy culture but it is also strategic. Allocating funding towards employee well-being is not an expense --it’s an investment in your organization’s future. These investments will result in happier, more satisfied employees, which can easily parlay into happier, more satisfied customers and a strengthened company brand-image.